ABSTRACT: New stratigraphic and paleontologic data indicate that ophiolitic melange windows in the Olds Ferry terrane of eastern Oregon contain limestone blocks and chert that are somewhat different in age than those present in the adjacent Baker terrane melange. The melange windows in the Olds Ferry terrane occur as inliers in the flyschoid Early and Middle Jurassic age Weatherby Formation, which depositionally overlies the contact between the melange-rich Devonian to Upper Triassic rocks of the Baker terrane on the north, and Upper Triassic and Early Jurassic volcanic arc rocks of the Huntington Formation on the south. The Baker terrane and Huntington Formation represent fragments of a subduction complex and related volcanic island arc, whereas the Weatherby Formation consists of forearc basin sedimentary deposits. The tectonic blocks in the melange windows of the Weatherby Formation (in the Olds Ferry terrane) are dated by scarce biostratigraphic evidence as Upper Pennsylvanian to Lower Permian and Upper Triassic. In contrast, tectonic blocks of limestone in theBaker terrane yield mostly fusulinids and small foraminifers of Middle Pennsylvanian Moscovian age at one locality.Middle Permian (Guadalupian) Tethyan fusulinids and smaller foraminifers (neoschwagerinids and other Middle Permian genera) are present at a few other localities. Late Triassic conodonts and bryozoans are also present in a few of the Baker terrane tectonic blocks. These limestone blocks are generally embedded in Permian and Triassic radiolarian bearing chert or argillite. 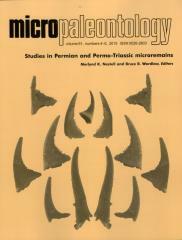 Based on conodont, radiolarian and fusulinid data, the age limits of the meange blocks in the Weatherby Formation range from Pennsylvanian to Late Triassic.